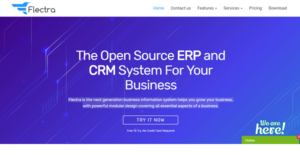 Flectra is an open-source business management software that integrates core capabilities of CRM and ERP systems into a single, compact, and powerful package. It is built with a modular approach, enabling businesses and organizations to include apps, features, and tools they need for their operations and processes but still enjoy the versatility to scale as their business grows and requirements change. With Flectra, users can easily modify the system to meet the unique needs of their business. As their business expands and their customer base grows, they can easily add more tools to Flectra so that all these requirements are fully met and addressed. Quite simply, Flectra is the ultimate business app suite. Flectra gives you a comprehensive, scalable business management platform that you can easily modify or configure to suit your current needs and then change again as your requirements shift. Being an open source system, Flectra provides you with all the freedom you need to make the software work for you and your business setup, instead of changing how you do things. Another benefit Flectra brings to the table as far it being an open source software is accountability. Developers are always monitoring the software to see if the changes they introduced really do improve the software’s performance. That means Flectra is continuously observed to ensure that all changes made to its core are actually beneficial to the users. From managing website content to handling marketing campaigns to organizing customer information, managing orders or performing business-related acquisitions, and more, Flectra’s modular design enables you to add or remove tools to make Flectra work for you. It is a comprehensive business suite that you can easily tailor to match your needs. And whatever your requirements are, you can be sure Flectra is so flexible to cover all your bases and help you remain functional and totally in control. What Problems Will Flectra Solve? Flectra gives you actionable insights and powerful reports that enable you to transform most business relationships into real revenues. Its intuitive sales pipeline visibility equips the sales team with the right information at the right time to improve their win rates. Flectra is a refreshingly simple, and blazing fast accounting software that anyone can use. No accounting knowledge required! Streamline all your money management activities, and get a bird’s eye view of your organization’s expenses, revenues, budgets, invoices, and more – all at the click of a button. Flectra Inventory Management System provides real-time visibility of inventory across the supply chain. It features built-in capabilities to streamline and automate low-level processes, and make quick, accurate decisions in the case of complex processes. Companies have unique wants and requirements and no software solution can be perfect in such a situation. It is futile to try to find an ideal off-the-shelf software system that meets all your business wants. The wise thing to do would be to adapt the application for your specific requirements, worker skill levels, budget, and other factors. For these reasons, do not rush and invest in well-publicized leading applications. Though these may be widely used, they may not be the best fit for your specific needs. Do your research, check out each short-listed application in detail, read a few Flectra reviews, call the vendor for explanations, and finally select the application that provides what you require. How Much Does Flectra Cost? We realize that when you make a decision to buy ERP Software it’s important not only to see how experts evaluate it in their reviews, but also to find out if the real people and companies that buy it are actually satisfied with the product. That’s why we’ve created our behavior-based Customer Satisfaction Algorithm™ that gathers customer reviews, comments and Flectra reviews across a wide range of social media sites. The data is then presented in an easy to digest form showing how many people had positive and negative experience with Flectra. With that information at hand you should be equipped to make an informed buying decision that you won’t regret. What are Flectra pricing details? What integrations are available for Flectra? If you need more information about Flectra or you simply have a question let us know what you need and we’ll forward your request directly to the vendor.